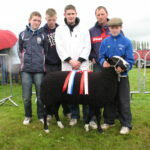 Zwartble shearling ewe the All Ireland Champion 2012 at Clonmel show on Sunday 1st July 2012. This ewe is owned by the Lyons family Kilconnell Co.Galway. 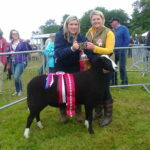 Rachael Megarrill’s Castlewellan Show Zwartbles champion with Judge Anagharid Francis Castlewellan show 2012.